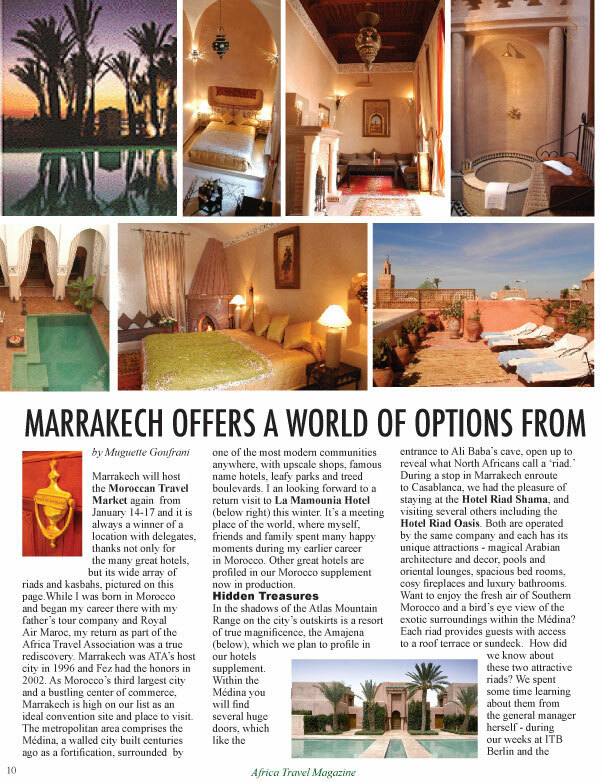 This 2 page spread from our Morocco World Edition also appears in our Venues Edition, which you can download now at no charge. Speaking of Train Travel. We have made several trips back and forth between Casablanca and Marrakech recently, and they have sparkling new railway stations (right), the rails are integrated seamlessly with other modes of travel. Like the country's railway network, the highways system is outstanding, with an ever-expanding autoroute. On July 14th. we were invited by the Consul General of France to attend the annual Fête de la Fédération (Bastile Day) in their beautiful gardens in Marrakech. It gave us a true feeling of the solidarity that exists between the two countries. 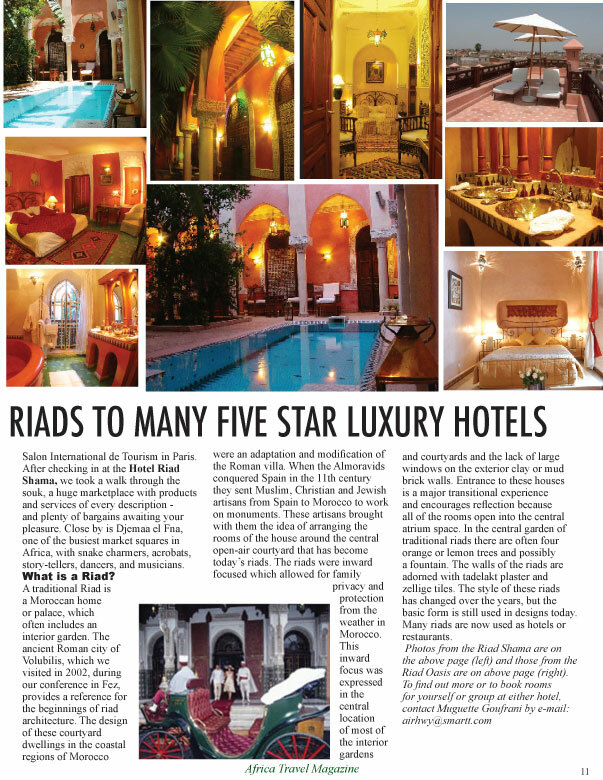 Marrakech is famous for its attractive Riads, which was an opportunity for us to develop our World Edition Supplement on this topic, which we began in 2002. A destination where one may enjoy the customs, culture and pleasures of laid back tourism, Marrakech is loaded with outstanding attractions, events and accommodation. Its conference facilities are a magnet for international events, trade missions and summits, such as our ATA Ecotourism Symposium at Le Palais d'Congrès. Where else are all the walls and buildings tinted in a rich pastel peach, the broad avenues and promenades lined with rows and rows of orange trees, with ripe fruit dangling from their branches like holiday ornaments? In five days of discovery, we managed to visit a wide cross section of hotel facilities, in order to give our readers an idea of the choice available for all price ranges. During a week long escorted tour, we had the good fortune of selecting a guide, who has become a good friend and ambassador for Morocco in general and Marrakech in particular. Chafiq Bahra speaks French, English and Italian, as well as Morocco's native languages, and is a member of Morocco's Professional Tour Guide's Association. Since our meeting, Chafiq has given me a solid grounding and understanding of the country and its people, including the basics of Islam. While I've much more to learn in the months ahead, our readers will benefit from his fountain of information in our coming issues. We had the opportunity to visit the elegant Hotel Mansour Eddahbi (right) where we were warmly received. Many of the staff remembered Muguette from her last visit when the Africa Travel Association brought a large contingent of delegates here for an Ecotourism Symposium in 1996. 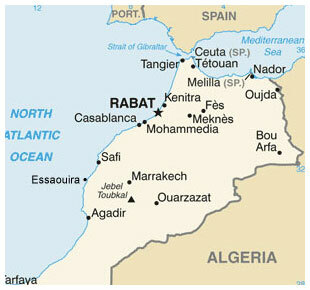 Watch for new items on this web site featuring hotels, resorts and guest houses in Marrakech as this series develops. Imperial Borj: While in Marrakech, we had the pleasure of a chance meeting with a familiar friend, Marie-Elyse Gbedo, former Tourism Minister of Benin. Later that day we met her at this great hotel for an interview session regarding her visions for West Africa in the coming decade. This meeting was timely, since Ms Gbedo was in the city for the African Professional Women's Association Conference, of which she holds a key position. Watch for her comments and a description of the Imperial Borj hotel later in our coming supplement on Expos, Great Meeting Places and Conference Sites. The latest news of our friend is that she has taken an active role in promoting the Beninese Soccer team on a world scale. Marie-Elise Gbedo made the international news a few years ago as a leading candiate for President. The Amanjena: When one thinks of luxury living, a standout in Marrakech is this relatively new resort. bordered by a lush 18-hole golf course on the city's outskirts, with the majestic snowcapped Atlas Mountains forming the background to a picture of paradise in North Africa. I welcomed the guided tour of this great resort, from self-contained suites, to dining area, library, business and health facilities. I look forward to the day when we can arrange a function for some of our North American corporate clients here in Marrakech. More to come in our description of the Amanjena and the international chain of upscale hotels and resorts it represents. La Mamounia: Muguette Goufrani and I had the opportunity to visit to La Mamounia twice during our stay in Marrakech She remembers this hotel as a meeting place, where herself, friends and family spent many happy moments during her career. The hotel's name was derived from its beautiful, spacious and deliciously perfumed gardens - a unique wedding gift to the Prince Moulay Mamoun from his father some 200 years ago (more about the gardens later). In 1922, architects Prost and Marchisio designed the hotel, combining the popular Art Deco look with traditional Moroccan designs. George Washington slept here? No but many well known icons of our times, from Ronald and Nancy Reagan, to Nelson Mandela, Charles de Gaule, President Franklin D. Roosevelt and Winston Churchill - helped make La Mamounia one of the most famous addresses in North Africa. Churchill referred to it as,"the most lovely spot in the whole world." Today, the suite this famous man stayed in 1943 during the Casablanca Conference was renamed in his honor. One of the world's great hotels, La Mamounia is located on the walls of the ancient city of Marrakech with the snowcapped Atlas mountains as a panoramic backdrop. What a grand movie setting! Speaking of movies, several well known films used La Mamounia as a setting, including "Morocco" with Marlene Dietrich, Hitchcock's "The Man Who Knew Too Much." Charlton Heston, Omar Sharif, Nicole Kidman, Sylvester Stallone and Tom Cruise are a few of the celebrities who've stayed here.Modern as today's most elegant world class hotels in terms of facilities, yet furnished and decorated in the art deco tradition, with an authentic Moorish touch. There's a golf driving range on site, plus a swimming pool, tennis and squash courts, beauty and health spa, fitness center. There are two golf courses nearby, and you're less than an hour's drive from downhill skiing in the Atlas Mountains. How's that for starters. Tourisme. La Mamounia a remport� le prix du meilleur h�tel urbain au Monde: 2013 repr�sente l�ann�e des honneurs pour la Mamounia qui f�te ses 90 ans puisque l��tablissement d�croche le prix du meilleur h�tel urbain au Monde attribu� par le magazine Cond� Nast Traveler , informe Incentivetravel. Didier Picquot, Directeur G�n�ral de La Mamounia qui a re�u la r�compense lors d�une c�r�monie � Madrid, a declar� : � Nous sommes ravis de recevoir cette reconnaissance de l'industrie h�teli�re qui vient s�ajouter aux nombreuses distinctions re�ues par l'h�tel depuis son ouverture en 2009 et continue � confirmer la position de la Mamounia comme un leader et un phare de l'h�tellerie de luxe au Maroc. C'est aussi une r�compense tr�s importante dans la reconnaissance de la Mamounia comme l'un des principaux h�tel de luxe dans le Monde�. L�h�tel embl�matique de Marrakech a rouvert ses portes en 2009 � la suite d�un vaste projet de restauration dirig� par le designer Jacques Garcia. La Mamounia avait �t� plac� par foxnews en mars dernier au dixi�me rang des �tablissements � ne pas rater. CANADA: Moroccan National Tourist Office: Suite 1460, 2001 rue University, Montreal, Quebec, Canada HA 2A6. Tel: +1 514 842 8111/2. Fax: +1 514 842 5316. Footnotes: Jerry W. Bird is President of ATA Canada Chapter, Editor and Publisher of Africa Travel Magazine, and Webmaster for the ATA web site. He also publishes Air Highways Magazine featuring aviation, tourism, transportation and business worldwide. His career began with the Edmonton Journal Daily Newspaper and expanded into the full spectrum of media - radio, television, magazines and Internet. Mr. Bird has won international awards for creativity in audio visual and print production.